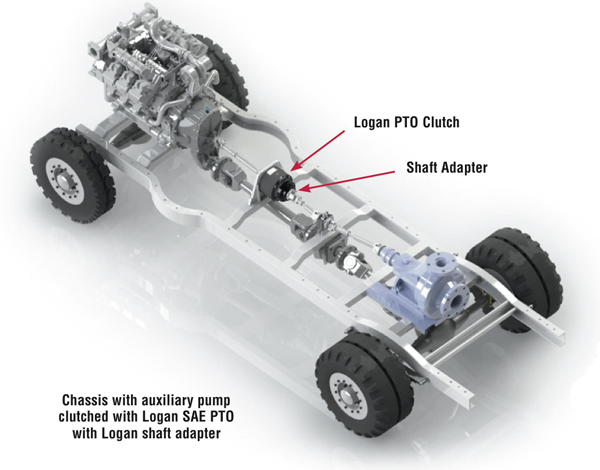 Logan PTO’s are used in a variety of Mobile, Industrial, On-Highway, Marine, Construction, Agriculture, Mining, Oil Field, and Rail applications – and are designed to mount between the power take-off of the engine and auxiliary attachment, i.e. single or multi-station pump drive. 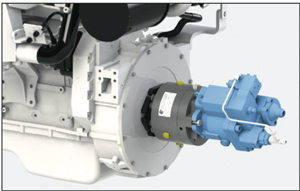 Logan PTOs provide live engine power for auxiliary pump drives - through a separate PTO drive shaft. 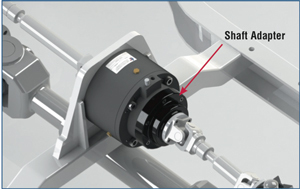 The Logan direct drive PTO clutch bolts directly to the OEM's Cardan Shaft (using a Logan shaft adapter), providing onn-off engagement of auxiliary drives or pumps in this example. Logan 600 Series with shaft adapter. 200, 600, 1000, and 1500 Series PTOs. 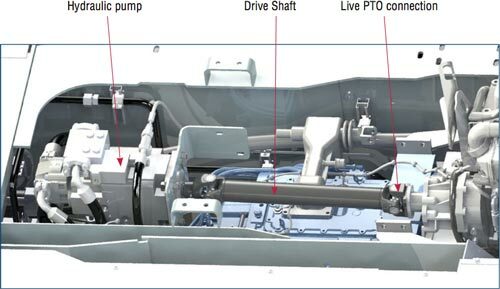 PTO is powered directly from the crankshaft, behind the engine's flywheel. Eliminates exposure of the PTO and pump to front-end collision damage. 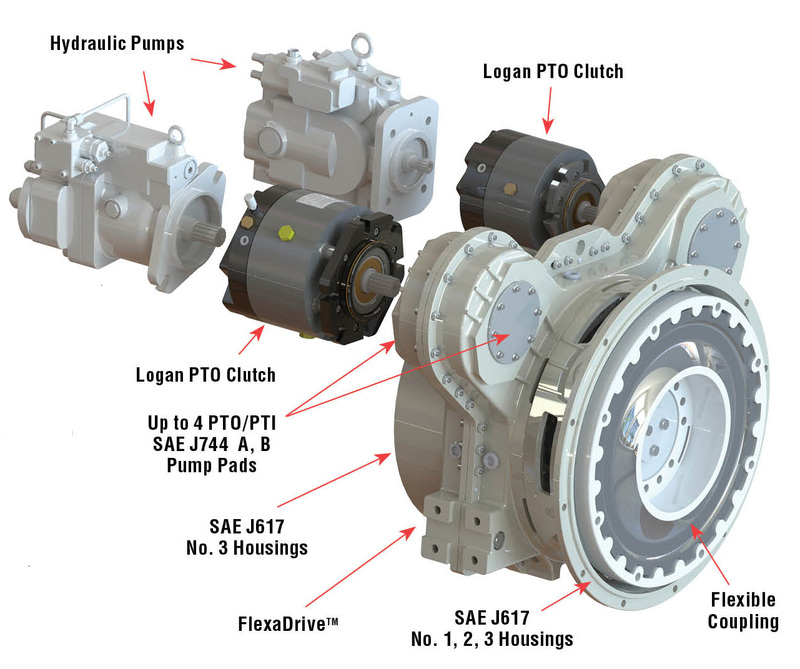 Logan SAE PTO Clutches can be directly mounted to a diesel / gasoline / combustion engine flywheel using a flexible coupling and mounting plate configuration. Standard sizes include SAE No. 3 to No. 7 Bells wqith input torque ratings from 159 lb. ft. (216 Nm) to 3000 lb. ft. (4068 Nm). 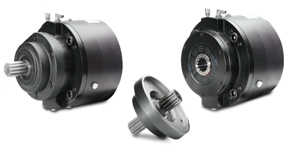 Clutch actuation pressures range from 100 psi (6,9 bar) to 320 psi (22,1 bar) for standard models. Applications include: Main and Auxiliary drives and gensets, hydraulic drive systems, blowers, vacuums, fans, winches, reels, and hoists. Standard Specifications: SAE PTOs can be adapted to No3. to No. 7 Size SAE Bells with input torque ratings from 159 lb. ft. (216 Nm) to 3000 lb. ft. (4068 Nm). Air / Fluid operating pressures range from 100 psi. (6,9 bar) to 320 psi (22,1 bar) for standard models. 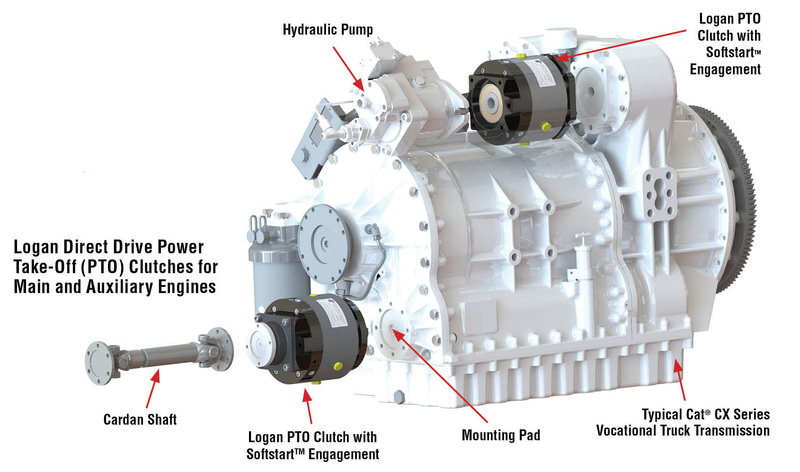 In this Oil & Gas vehicle application, the Logan SAE 600 series Direct Drive PTO is mounted on a typical 2-pad live PTO pump pad, sandwiched between a CAT 3412 Diesel Engine and an Allison 8900 Series Transmission. 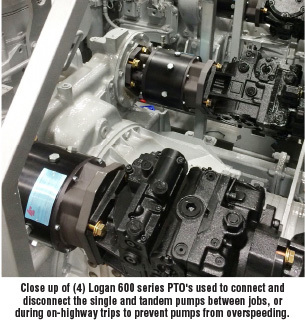 The Logan 600 series Direct Drive Power Take-off (PTO) clutch will connect or disconnect the single and tandem pumps mounted to the live PTO pump pad. The pumps are used only on the job site, and remain disconnected (via the Logan PTO) when the vehicle is idle and not in use, or when driving to and from the job site. This option to clutch-in and clutch out the pumps minimizes wear and tear on the pumps, reduces unnecessary fuel consumption, and the chances of over speeding the pumps (since they are disconnected from the drivetrain) when the vehicle is at highway speeds during transport. Most OEM manufactureers of mobile equipment use hydraulic poston pumps to control machine movements and attachements. 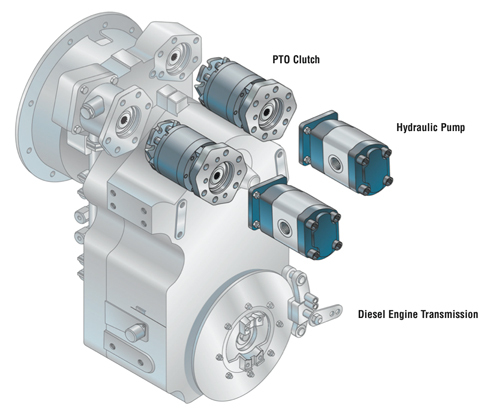 In many cases these hydraulic piston pumps are driven remotely from the engine's auxiliary PTO drive via a slip yoke shaft. Machine Operators must be able to turn these pumps on and off when the vehicle is driven from job site to job site - in order to prvent overspeeding the pump with the engine is running faster than the pump's normal hydraulic work speed. There is also the potential for all the pumps to engage at once, which would cause the input torque rating to be above the engine specifications causing hydraulic system and pump failure. In this situation, customers were going beyond the limits of the machine and pump specs - the OEM had to do something quickly - they contacted Logan. Customer experienced pump over-speeding between job sites, causing system failure, warranty claims and downtime. 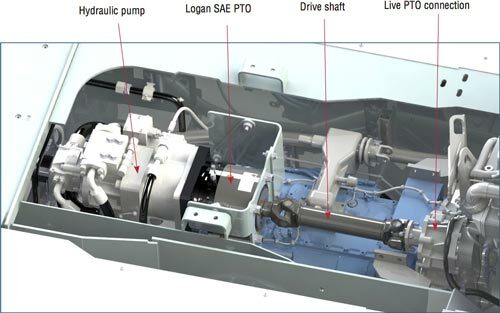 In most cases the pumps are already defined by the customer, which requires Logan to fit with small envelopes, sandwiching the Logan Clutch in between the pump and engine, requiring a Logan shaft adapter to support the cardan/drive shaft connection. 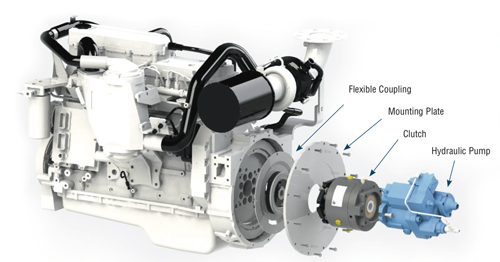 After considering all of the options with Logan application engineers, the OEM selected an SAE PTO 1200 Series Clutch. In less than a week, extensive lab and field tests were conducted. Results were positive. The OEM quickly created space to sandwich the Logan Clutch between the driveline and the piston pump - thereby eliminating the possibility of over speeding the pumps. This solution enabled the OEM to keep its customer base happy by eliminating unnecessary machine downtime. 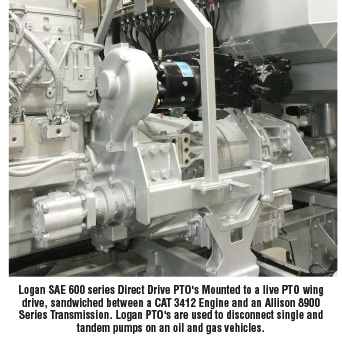 Logan SAE PTO installed between the hydraulic pump and drive-shaft, enabling connect-disconnect, on demand power to the OEM's piston pump. Direct Drive PTO’s are self-contained, fluid or air activated clutches, positioned between a live PTO pad and hydraulic pump. 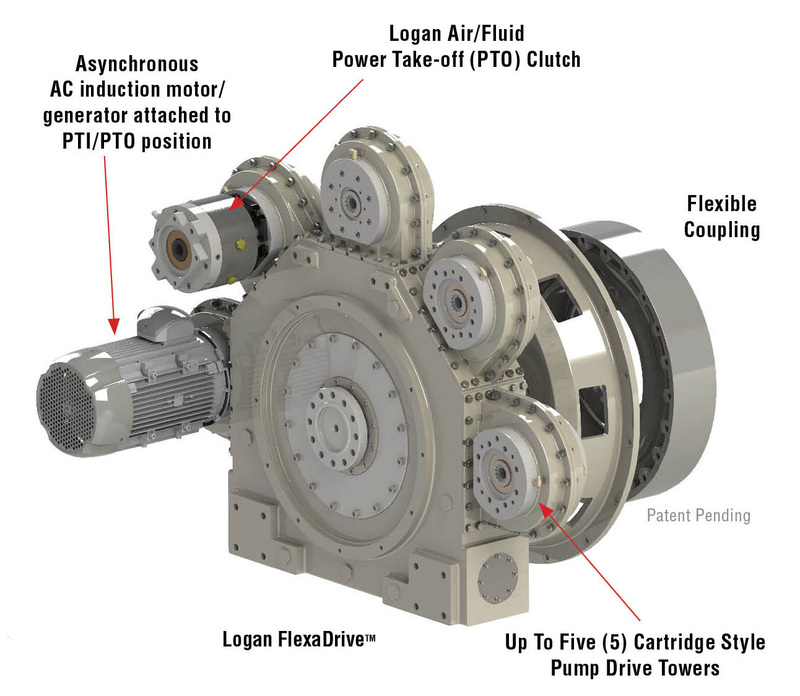 The Logan 2-Position Pump Drive is outfitted with up to four (4) PTI / PTO pads, and can accommodate up to 730H (544 kW) Engines, with maximum Speeds up to 2600 RPM, and a maximum of 160 HP (120kW) per tower under continuous duty. 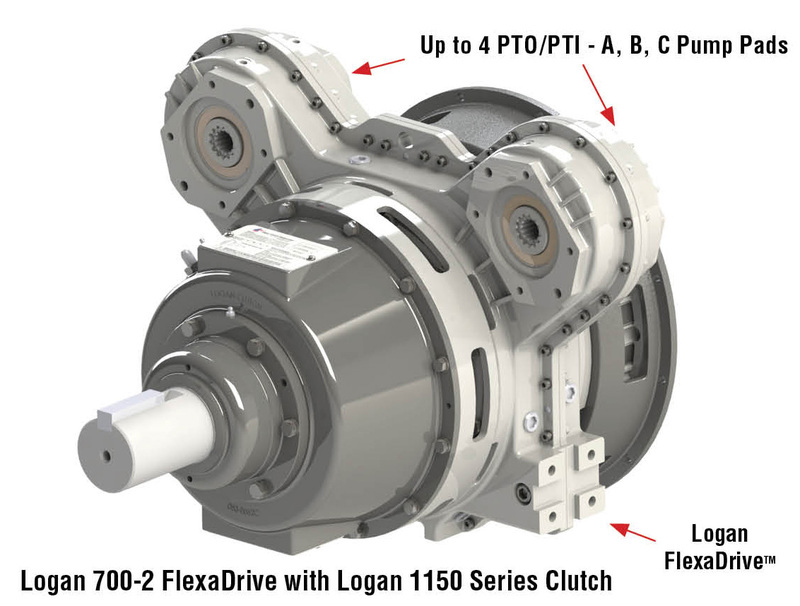 The Logan FlexaDrive: is a multiple pump drive system, sandwiched between your engine and clutch, or transmission, allowing up to ten (10) live PTO / PTI pumps pads for a wide range of requirements such as drive shafts, pumps, pulleys, and clutchable power take-offs.